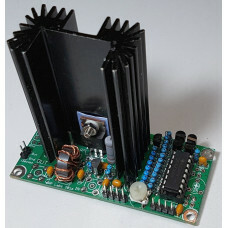 This 5W HF PA kit features an IRF510 MOSFET as the amplifier. But it also includes a discrete component power modulator (like a voltage regulator), which is controlled by an 8-bit Digital to Analogue Converter (DAC). A microcontroller can load a 74HC595 shift register with a sequence of DAC values which closely replicate an ideal raised cosine RF envelope. This makes a very clean CW transmission, practically eliminating key clicks. The kit is on an 80 x 37mm PCB, the same size as the Ultimate3S transmitter kit and relay-switched filter kit. It can be used with the Ultimate3S transmitter kit. Firmware versions v3.12 and above are capable of generating the raised cosine keying envelope. The connections required for use with the Ultimate3S transmitter kit are described in App Note AN004. Requires Ultimate3S firmware v3.12 and above. The kit can also be built in a standalone mode, with onboard raised cosine envelope keying generated by an optional ATtiny84 microcontroller. This is plugged into the IC socket on the PCB instead of the 74HC595 shift register chip. The ATtiny84 is programmed to produced the raised cosine RF envelope and also provides a key-out signal which can be used to key a driver stage. This application of the kit is perfect for use in your homebrew transmitter projects. It is described in App Note AN005, which also includes discussion of a 5W CW transmitter built using the QRP Labs VFO kit and this 5W HF PA kit. The programmed ATtiny84 microcontroller is available as an option. Finally, one or more circuit blocks may be bypassed. A simplified assembly manual details a simplified way to assemble the kit, without using the power modulator and raised cosine keying generator circuits. This may be suitable for people who wish to build a more simple PA that does not include the raised cosine keying facility. More details, assembly instructions etc are on the QRP Labs 5W HF PA kit page.